I know you're in a hurry to make these and gobble them up but let me show you a few things first. I'm sure a lot of people already know this, but I do run into folks from time to time who do not, so it's worth repeating. 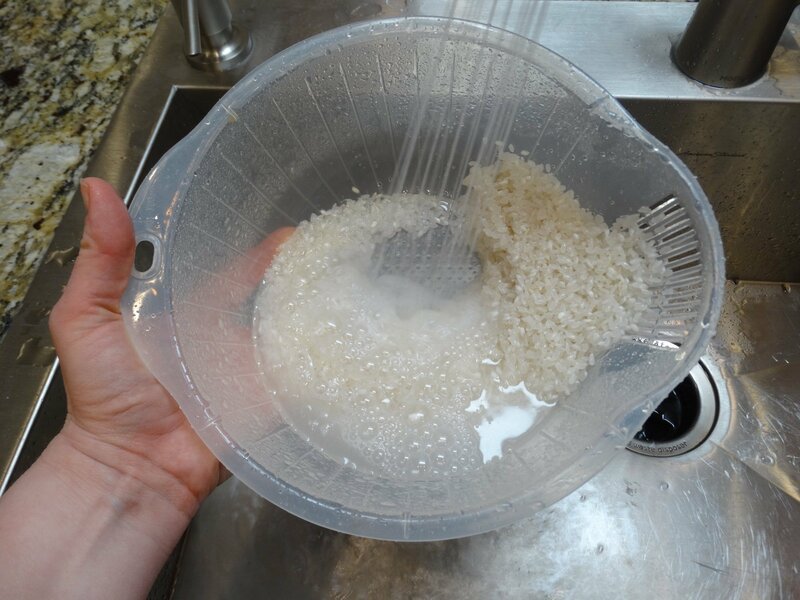 Rinse your rice before cooking. 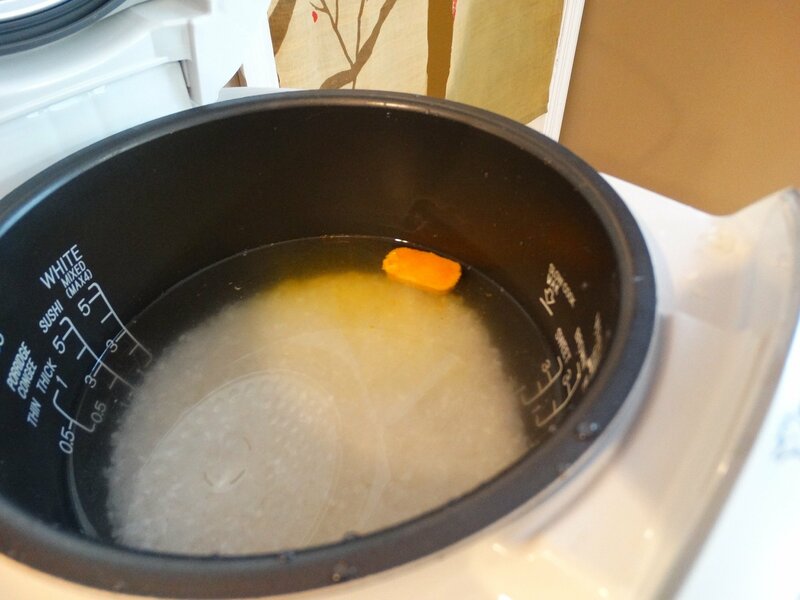 After you have rinsed and drained the rice, you can use any method of cooking the rice, but we like using a Zojirushi rice cooker. If you cook rice a lot, you might want to invest in one. Also, if you're going to color your rice, you can use a bit of turmeric or a slice of beet to do the trick. I keep some cubes of turmeric and ginger in my freezer that works well. When the rice is ready, allow it to cool slightly before working with it. 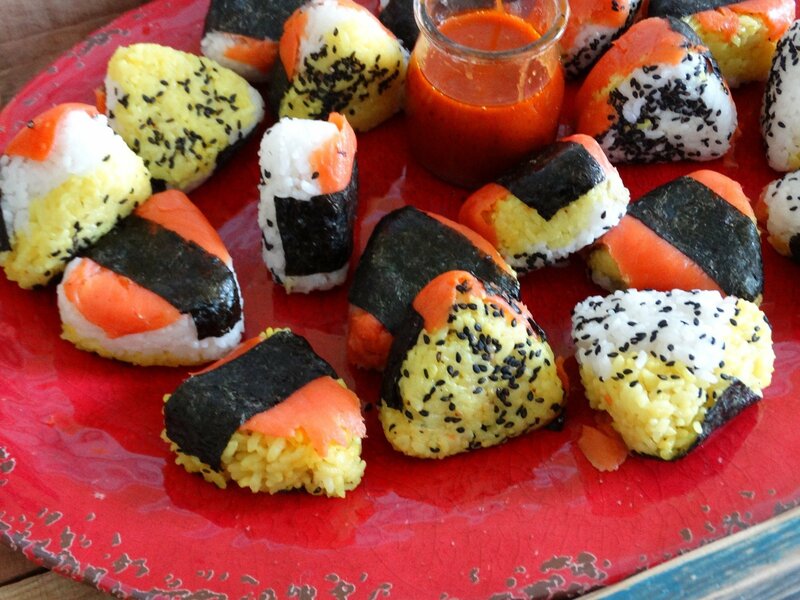 Use all plain sushi rice or use a combination of colored rice to add contrast. Here's a tip though, if you do use turmeric, go ahead and add a bit of black pepper to your rice to make the turmeric more useful to your body. It helps if you have all the components in one area when you get started. Also, preparing these close to the sink helps because sushi rice is sticky and you'll end up rinsing your hands a lot. So, have a towel close by too. If you buy sushi nori, it comes in scored square sheets. Just cut the strips and then cut them in half. It's no big deal if they aren't straight or perfect. Kids love helping with this part. 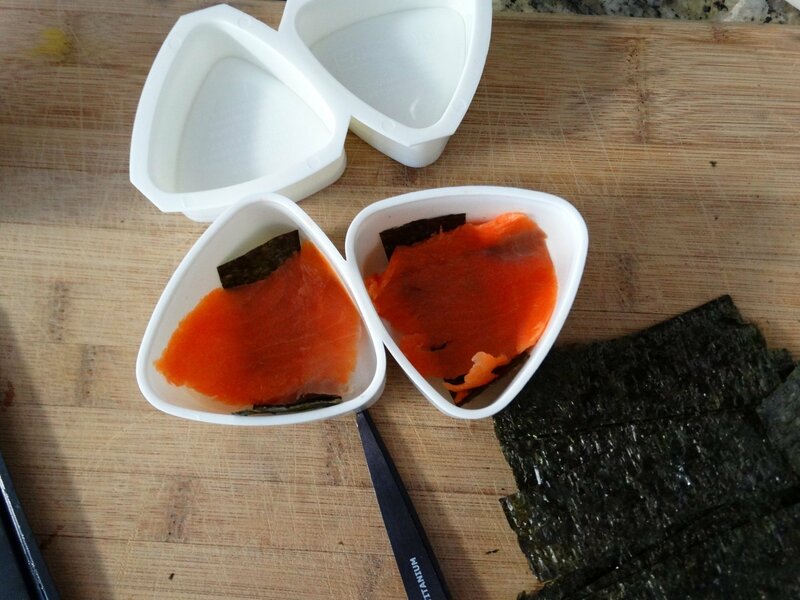 Using the strips line the onigiri mold with either one or two pieces of nori. Try to find premium toasted dried nori sheets so the nori doesn't end up tough and chewy. That's no fun. The better quality the nori is, the easier it is to chew. 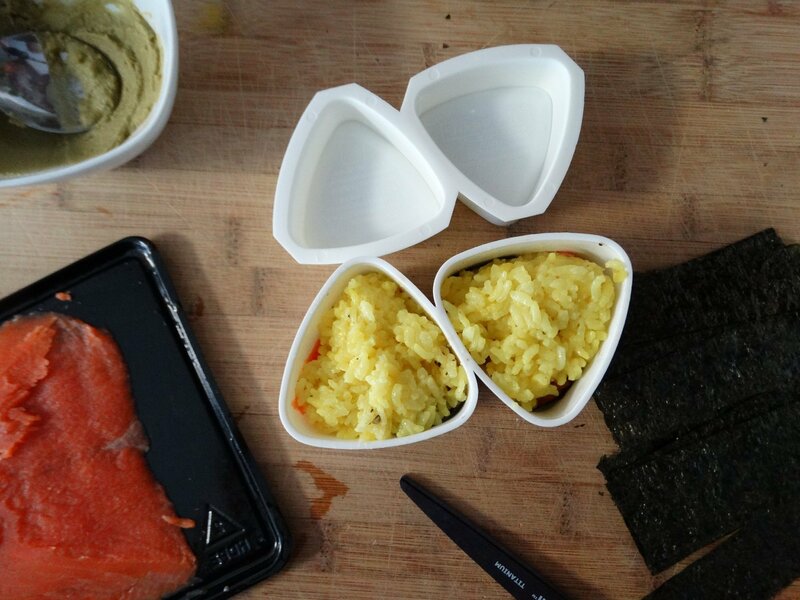 You don't have to use a triangular mold, you can use any onigiri mold shape you like. You'll find the mold that I use on my Kitchen Idea list on Amazon. 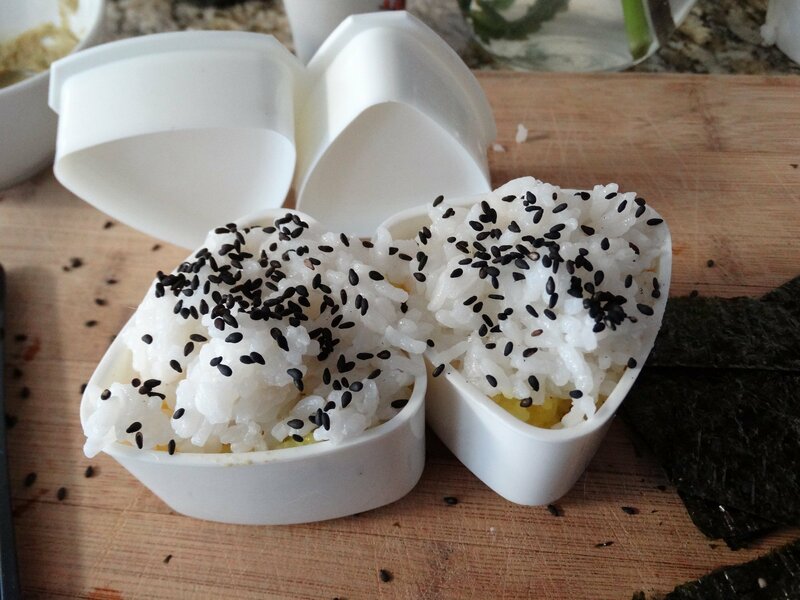 After you add the nori sheets to the onigiri molds, you can just tuck them down in there with your finger; it's okay if they lift up a little, the other ingredients will hold them down. Layer the smoked salmon on next. 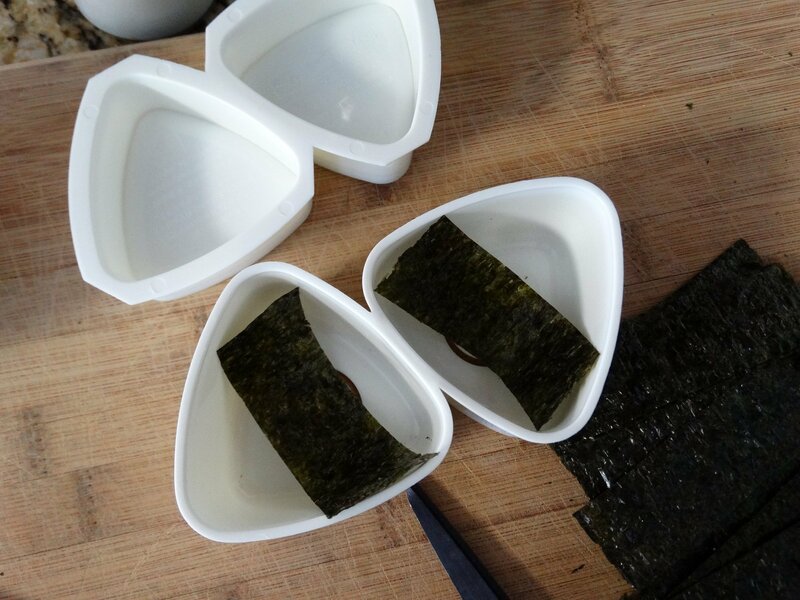 I just pull off little pieces that look about the size of the bottom of the onigiri mold. 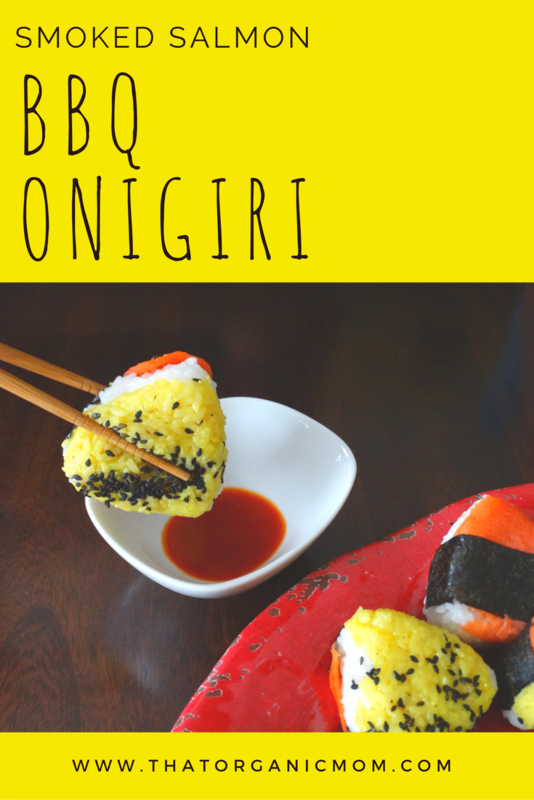 An eight-ounce package of smoked salmon will make 20 smoked salmon bbq onigiri. 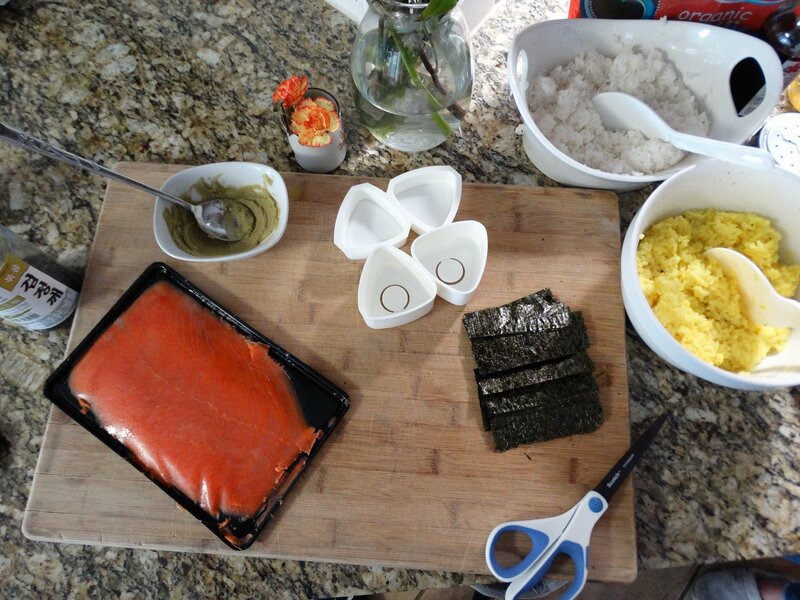 After the salmon, next layer on the sushi rice. You can use just white or just colored or mix it up. 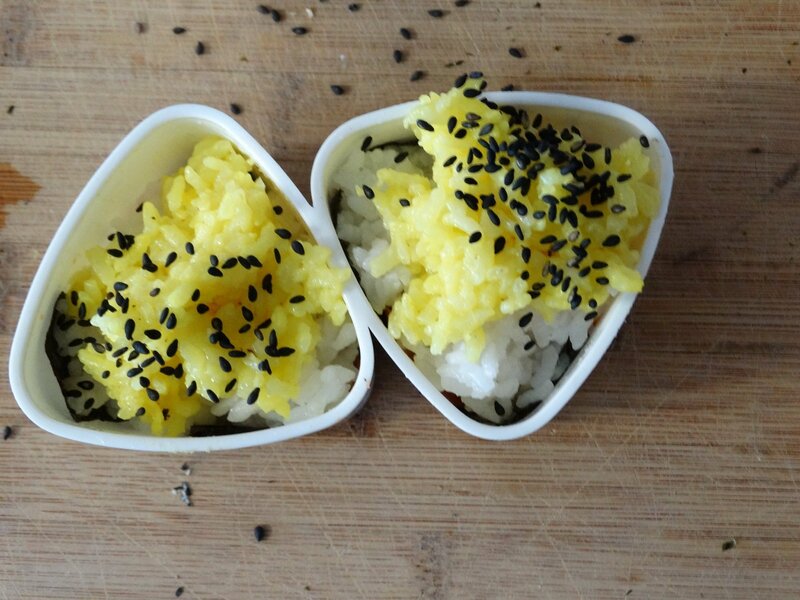 Sprinkle sesame seeds (black or white) on the rice last of all before pressing down the top of the mold. Repeating until you've used all the smoked salmon. There are several ways you can use the BBQ sauce. Sometimes I brush it on with a silicone basting brush. 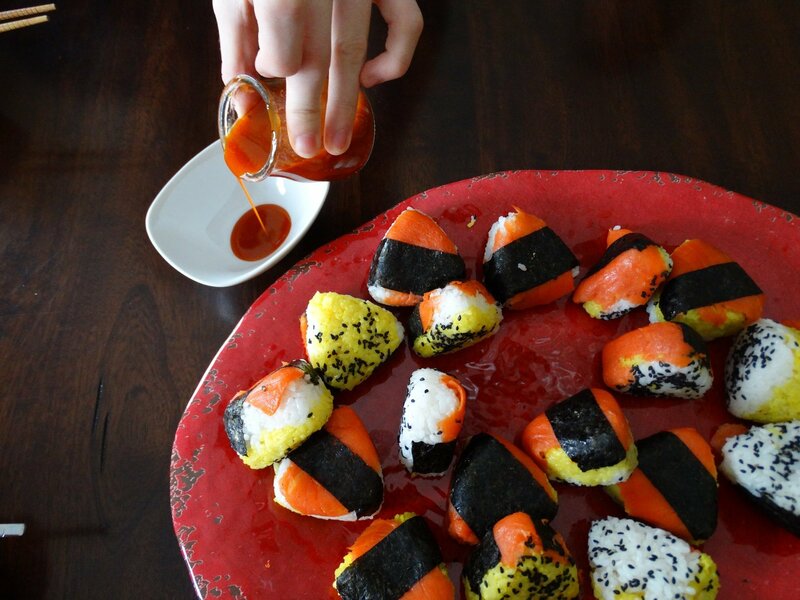 Other times I let the kids dip the onigiri into the sauce. Alternatively, you can use a squeeze bottle and drizzle it on top. 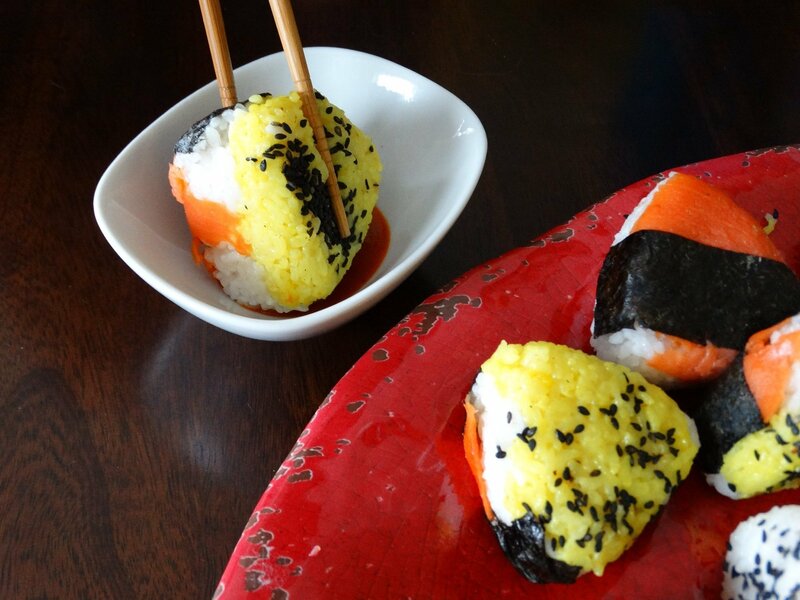 Kids love eating these my smoked salmon bbq onigiri both with chopsticks and by hand. You can use your imagination and add other ingredients. Sometimes I serve them with some pickled ginger. No matter how I serve them, they don't last long at all! 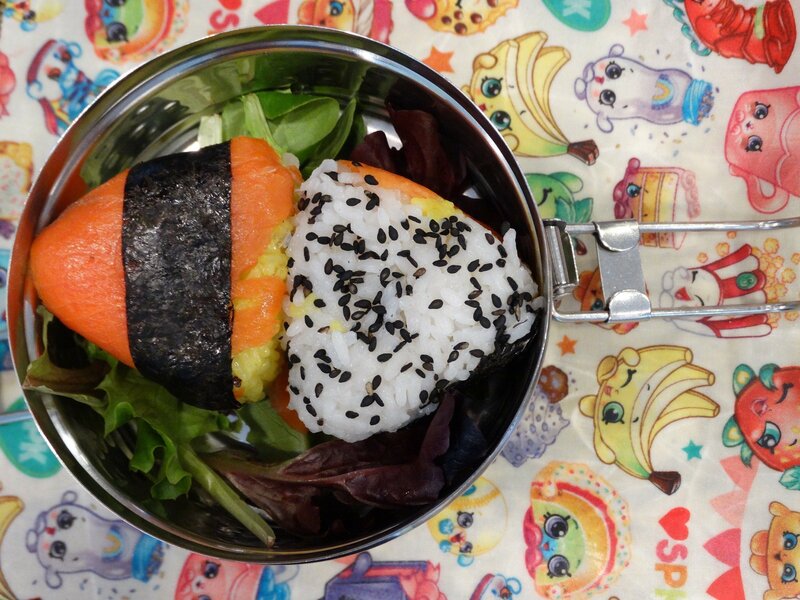 If you ever do have some leftover, go ahead and pop them in a lunch pail. These are for my husband's lunch tomorrow. I had to hide these before I let the kids dig in though! Prepare sushi rice according to instructions on package. While rice is cooking mix BBQ Sauce ingredients in a shaker bottle. Mix vigorously to incorporate oil. When rice is cooked remove from heat and stir in 1 tsp of rice vinegar, sweetener, and salt to taste (some people use seasoned rice vinegar). Set aside. 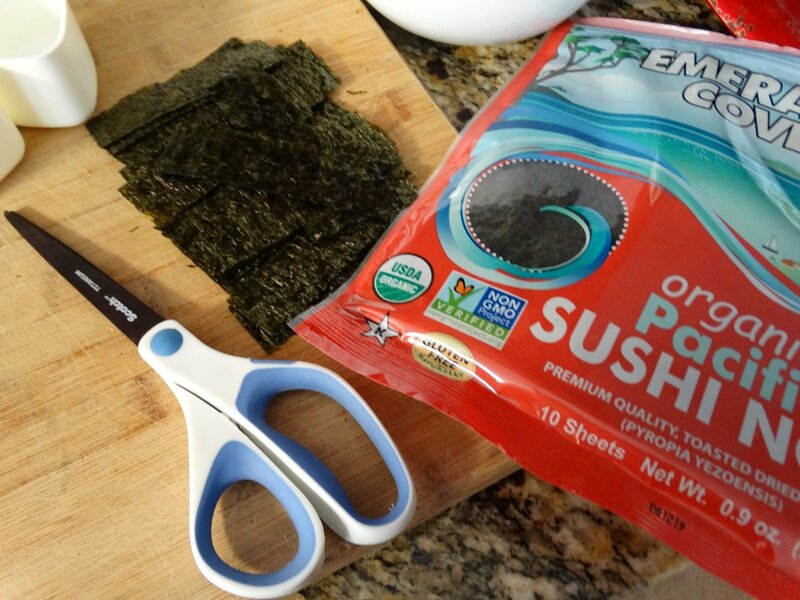 Cut 2 sheets of nori into strips (most have little lines you can follow) then cut the strips in half. Mix wasabi powder with a few drops of water to make a paste if you are using it. Pop out onto a platter. 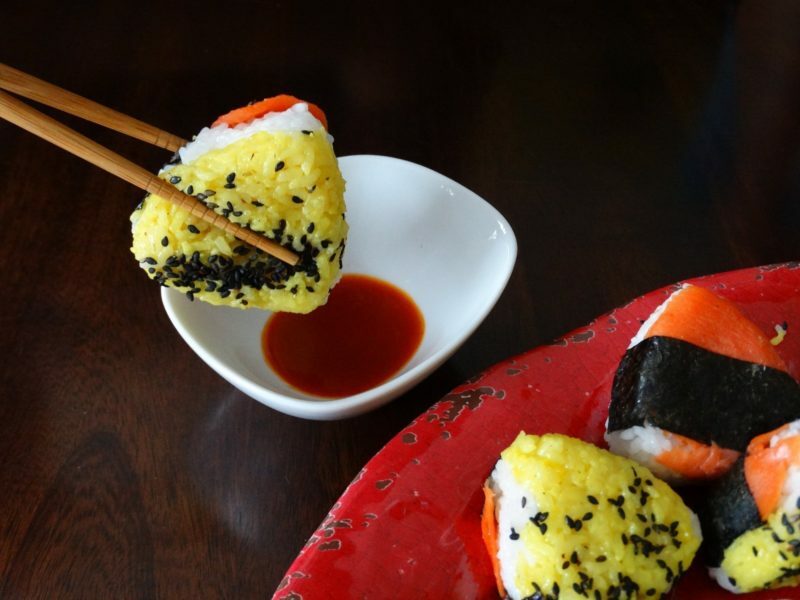 To make different colored rice, you can add turmeric to the rice cooker while rice is cooking for yellow rice or a slice of beet for pink rice. 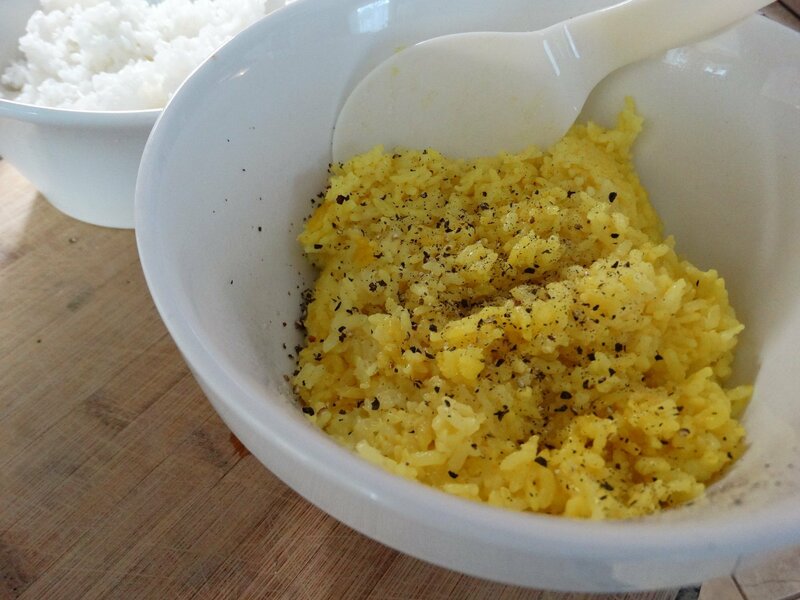 It makes a fun contrast to the white rice and it's added nutrition. I keep some cubes of turmeric and ginger in my freezer. Yong's hot sauce has a slightly sweet flavor, so if you are using regular hot sauce you might want to add a little something sweet like maple syrup, honey, or erythritol to the BBQ sauce ingredients.